Can I complain a little and tell you that the closest vegetarian (not even vegan!) restaurant is about two hours away from us. You’re probably thinking “Just order fries! Fries are vegan!” or “Get the veggie sub at Subway!”. The truth is, I’m not just a vegan. I’m a paranoid vegan. Possibly the worst kind of vegan. I’m afraid of meaty or cheesy fingers touching my fries. What are the fries even fried in?! Are they being fried with the chicken fingers?! What I’m getting at is, we don’t eat out. We just don’t. I spend the entire time wondering if I just saw a bacon bit in my salad. Or if the bread is brushed with egg whites/real butter. 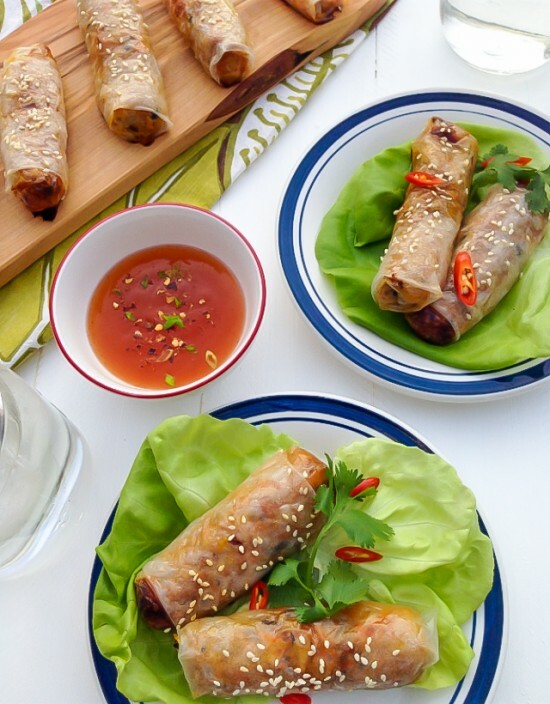 So, we had been missing many things that we used to get when I was a little less paranoid, among those things: baked spring rolls. And that is how this recipe was born. Note: If you have small children, or run short on time in the evenings, I suggest making the filling ahead of time. It’s kind of a process to make the filling, wrap them all up, and then bake them. 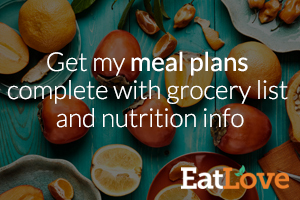 Prep all of your veggies and tofu. It really saves me time to get everything ready before hand. Sauté your onions in the olive oil, in a large pan, on medium heat. When onions are transparent add your garlic, ginger, and tofu. Cook for a couple minutes. Make sure to stir frequently so you don’t burn the garlic. Add cabbage, carrots, liquid aminos, agave, vinegar, and sesame oil. Simmer on low heat until your carrots and cabbage are cooked, but not mushy. Add your green onions and cilantro. Take off the heat. Line a baking sheet with parchment paper, fill a shallow dish (I actually use a dinner plate) with very hot water. Place a sheet of rice paper into the water, it’ll soften after about 30 seconds or so. Lay your rice paper out, add 2-3 tablespoons of filling to the middle but towards the bottom of the paper. Roll the edge closest to you over the filling, flip in the slides, and then roll until seam is sealed. The rolling can take a little practice. I’ve ripped a few papers in my day! 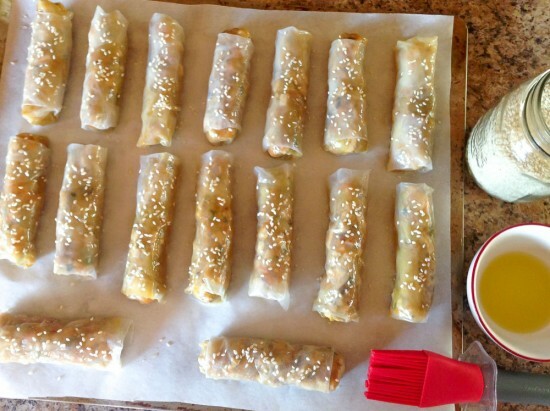 Transfer your spring roll onto your lined baking sheet. Continue making rolls until all of your filling is gone. Pop them in the oven and bake for about half an hour. I keep my eye on them, tapping them to see when the paper becomes hard and crispy.